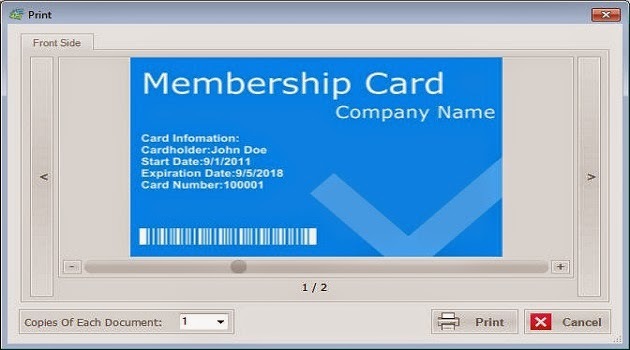 Having a membership card software at hand can prove to be an advantage for a business. Especially in the case of a growing and expanding business will find this software to be very useful as it has to deal with increasing numbers of full-time as well as contractual employees. In this situation, the software can be used for eliminating the burden of having to design identification cards manually. In simple terms, this particular software is a multi-layer powerful ID card designer that enables the user to make identification cards by simply importing or typing personal method seamlessly. A good quality software is one that’s simple and easy to use and only requires basic computer skills for making ID cards and operating the program. It will have ready-made templates allowing users to insert text, images, vector shapes, barcodes and logos that can be edited and people should be able to arrange them when they like. Typically, free ID card management software lack these features. However, having them can prove to be immensely beneficial because it encourages easy input of membership details. Moreover, pictures can also be taken on-site with the help of an image capturing device like a webcam. Apart from that, high quality software will also have a built-in records manager hat can be used for modifying, editing and deleting records in a streamlined way. It can also be integrated with barcode scanners for making member identification on-site. Compatibility with digital cameras, webcams, scanners and files is another feature of good ID card software because it makes it easier for people to import and capture images. It should also be able to connect with different printers easily for printing out the cards that are created. There are usually Laser Inkjet printers that are used or ID card printers. Each has its own mode, which can usually be found in a corporate software. Hence, using ID card software can be a boon for businesses because it can eliminate the tedious tasks involved in management and makes it easier to keep track of the employees.